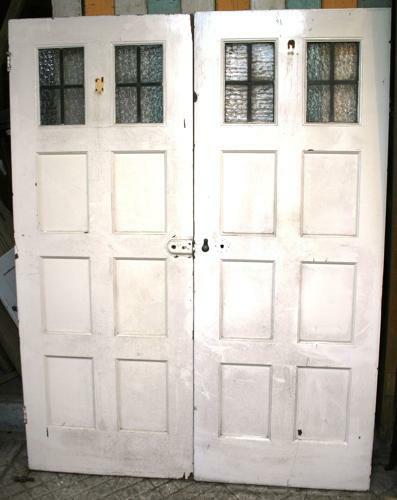 A pair of 8 panel Edwardian pine doors with leaded lights. Probably made from pitch pine, these doors are for internal use only. They have an Arts & Crafts feel and there are 2 leaded light top panels on each door. The doors are of stub tenoned construction and date back to c. 1925. (Please note the surface mounted lock is not included in the offer). These doors were originally 2 matching single doors which we have paired. We can set up the doors with rebates where they meet, if needed. Please contact us for a quote.